As a designer one of the most annoying things about developing and maintaining a WordPress theme is that Google Analytics counts every visit from your machine, even when your just working on an offline development sever as I do. This is especially crucial when a site is launching and all the visits from the local server can throw your stats way off, as seen in the image here. 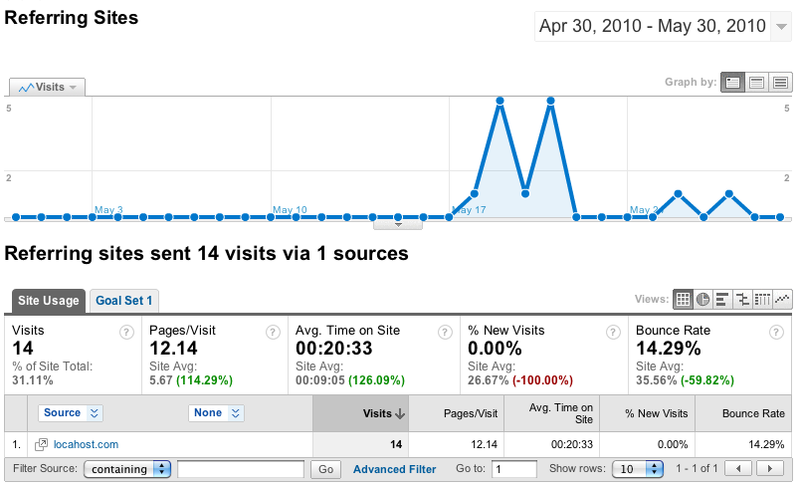 There are a few existing ways to stop Analytics from counting your visits, one of the best is by using this method on HubPages that gives your browser a name and then creating an exclude filter on Google Analytics. It’s a good method but it doesn’t work cross-browser and involves some tinkering on the Analytics backend. The method I use, uses PHP to check if the current user is an Admin and inserts a link to the WordPress admin panel. If the user isn’t an Admin it loads the Analytics code instead. Don’t forget to change the UA-000000 to your own Analytics ID. You can change the first line to exclude Editors and Authors by changing the current_user_can function, have a look at the Capability vs. Role table in the WordPress Codex. You also can completely remove the second line if you don’t want or need a link to the Admin panel, but I found it a useful visual indicator that the code was working. Welcome to my new quaint little blog. I’ll be sharing some tips, reviews and other assorted snippets. Come back soon Y’all! I’ve been covering the rise of the far-right, anti-Islamic English Defence League for the last year or so now. Their protests across the county have grown considerably from the few hundred that I first photographed in Birmingham, to the thousands in Dudley this past weekend. Hallmarks of the EDL are insobriety, violence and racism. Their violence is often unprovoked and directed indiscriminately at whoever is nearest; be they police, press or anti-fascist protesters. Journalists who have exposed the EDL’s true nature have received death threats and photographers often come under a hail of glass bottles and coins when covering their protests. Today I’ve written a report of what happened in Dudley this weekend, which I believe has been their largest protest yet, for the Expose the BNP campaign website. The EDL are the only political group in the UK holding regular protests every month attracting thousands of supporters from around the country. Unite Against Fascism, which usually call counter-protests to the EDL, originally outnumbered them 2:1 now the opposite is true. The threat from the EDL is real and growing. As journalists we must ensure their violent, racist core is exposed. The EDL are not simply “Peacefully protesting against militant Islam” as their publicity rather quaintly says and we must show that. Expose the BNP are holding a pre-election Media Briefing on Wednesday 7th April on the BNP and far-right. Can we take a step back please? Earlier today I attended a memorial for Ian Thomlinson, the paper seller who died during the G20 protests last year. There were numerous protesters there and even some of the organisers of the G20 protests. His family were also there to lay flowers at the spot where he died face-down on the pavement after being hit by a policeman. There has been a lot of coverage of the Thomlinson case, so naturally there were a lot of photographers and broadcasters there to cover the event. But what I didn’t expect was the disgusting way that some, of what I would like to call colleagues, behaved both before and during the event. As one of the organisers of the memorial told the assembled press pack that the family would be arriving shortly and asked that we be respectful and take a step or two back. One photographer asked how many of the family would be there, he replied that it would be ‘a few’ the photographer said that ‘two or three is all we need’. It is our job as journalists to document events, not orchestrate them. Shortly after the Thomlinson family arrived and a priest from the local church began to address the crowd, a broadcast presenter standing next to me interrupted him to ask if he would turn the other way to face her cameraman. He ignored her and continued to address the crowd asking for a minutes silence. As the silence grew longer photographers around me were inching closer to the family as they stood weeping at the spot where Ian died. At one point one of the Thomlinson family had to push away a video camera that was beginning to brush against her head as the cameraman tried to get closer to Ian’s widow, Julia Thomlinson. Then as the family left the memorial in tears they were chased down the street by a mob of photographers and cameramen, probably as they hadn’t been able to get a clear shot of the family at the memorial because they were surrounded by photographers, lenses inches away from their faces. I can understand why there is a pressure to get these images, it’s difficult to explain to an editor that you didn’t get the shot because some idiot with a wide angle lens wanted to get in close. As soon as one person gets in close, everyone else has to get in close to get the shot. As photographers we should be self-policing at these sorts of events, otherwise either we won’t be invited again or someone else will start policing them. A number of other photographers and myself repeatedly asked for people to take a step back but our requests fell on deaf ears. In cases involving personal grief or shock, enquiries and approaches must be made with sympathy and discretion and publication handled sensitively. So all I’m asking is, next time, can we all take a step back please? Yesterday I went to the Democracy Without Journalists meeting in Portcullis House organised jointly by the National Union of Journalists and Goldsmiths Centre for the Study of Global Media and Democracy. The committee room was packed out with journalists, academics and students. All crammed in to hear about what could be done to secure the future of local and regional journalism in the UK. I got an interesting email the other day asking if Demotix is good for distributing work – the short answer: No. If you haven’t heard of it yet, Demotix is a citizen reporting/freelance photography agency. Taking an industry standard 50% cut of image sales, they say they broker images to media buyers worldwide. Which is great if you’re a citizen reporter (not journalists, as some call them, but more on that another time) who happens to photograph a breaking story that no-one else has got. Like Bill Carter, one of Henry Gates’ neighbours who grabbed his camera when he saw police cars outside his neighbours house. The resulting images have netted over $4,000 in sales, with half going to Carter. This is the sort of thing Demotix thrives on. When the Iran election protests began last year images from Demotix users were featured on the frontpage of the New York Times twice in one week. But unfortunately for photographers there isn’t an uprising or other major breaking international news story every day. I flirted with Demotix for a month or so last year, uploading a total of 12 stories, mostly of protests but also some other events, a meeting of the Metropolitan Police Authority, ministers leaving a cabinet meeting at 10 Downing Street and the opening of Banksy’s Summer show in Bristol. Not one of the images I uploaded has sold. One was featured in the Demotix Widget, which appears on a various newspaper websites and for which I was paid a nominal amount. It’s quite probable that the images wouldn’t of sold even if I’d distributed them myself, at most of the events I covered there were also staff photographers from large international news agencies: Getty, AFP, AP, Reuters etc. The other events I covered obviously did not fit into the news agenda that day or week so remain unsold, which is often the reality for freelance photographers working on spec. Slightly disheartened that none of my images had sold, I reverted back to how I had distributed my images previously, uploading a web gallery of images and emailing the link, as well as a small selection of the images directly to newspaper picture desks. Just after I had given up on Demotix I covered a breaking news story, Nick Griffin and Andrew Brons had just been elected MEPs for the British National Party and were holding a press conference outside Parliament. I found out just an hour before, grabbed my kit and jumped on the tube. I got there just in time and within minutes of the press conference starting anti-fascist protesters appeared chanting anti-fascist slogans and began throwing eggs. I and a number of photographers who were at the front of the press pack captured the moment the yolk hit Griffin as he was rushed into a car by minders. I quickly got out my laptop and captioned and emailed the images to the newspapers, all within minutes of it happening. As I filed my images I was sat with another freelancer who was uploading his images to Demotix, he complained that the Demotix FTP upload was often slow and sometimes didn’t work at all. He also mentioned another thing I was familiar with from submitting images to Demotix, it sometimes took several hours for stories to be published on the site, as each has to be approved before appearing on the site, often longer outside office hours. My images appeared in that days Evening Standard, the Daily Express the day after, The Telegraph website and the Sunday Telegraph that weekend. My colleagues images appeared on Demotix a few hours later and have yet to sell. Speaking to several other Demotix contributors in London they say they have yet to make a sale through Demotix either, even those with hundreds of images and stories on the site. Most have earned the £12.50 Widget usage fee, which is paid if your work is featured on the Demotix Widget. £12.50 might cover your travel costs if you went by train or took a short car journey, it is hardly enough to make a living though. One Demotix contributor I spoke to said he’d made around £150 over a few months from widget use, which is certainly something, but he has yet to make a single sale through them. There is no doubt that Demotix contributors have taken some excellent images, this image by Alessandro Vanucci of a Cambodian rubbish dump made the Eyewitness page of the Guardian. Other times Demotix contributors are simply the only ones there to get an image. Their coverage from Iran for example or the exclusive photograph of Ian Thomlinson lying on the pavement shortly after being assaulted by police at the G20 protests in London last summer. But is Demotix the unique factor in these images selling? Almost certainly not. Just like other online photo agencies, Demotix is a (sometimes) convenient middleman for amateurs and semi-professionals. Images from Iran or of Ian Tomlinson lying on the pavement would of sold if they had been on Flickr, Zooomr, PhotoShelter or any of the myriad of other sites that allow users to upload their images for free. Demotix is trying to make money out of low value sales of unique coverage in unusual circumstances – precisely the sort of thing that is easy to find once on the internet. It is not clear to me where they “add any value”. As soon as photographers realise they can spend an afternoon Googling the picture desk contact details of all the media buyers (PDF) Demotix supplies they can take back the other half of their 50% cut, upload images to Flickr or wherever they want, whilst still charging a professional rate. So is Demotix good for distributing work? Well they are, they’re just unnecessary. Last night seven of the eight candidates for the next editor of the NUJ’s magazine the Journalist were at hustings hosted by London Press & PR Branch at the NUJ’s head office in Kings Cross. Each candidate was first given five minutes to introduce themselves and their candidacy after which questions were taken from the audience. One of the most divisive subjects between the candidates was the level of involvement that online should have. Some said it should continue in it’s current form as ‘complementary’ with a PDF of the print edition, others were much bolder in their proposals of daily news items online, more discussion of issues and the use of social media. Candidates were asked how they would generate income outside the central funding allocated to the magazine, Steve Usher said “The magazine is a potential goldmine to fund all the web work we need to do. It goes out to over 40,000 ABC1 journalists, advertisers offered that will go for it big time” Richard Simcox proposed that revenue should be increased by the recruitment of new members, not advertising. He quipped “I’m a union rep, not an ad sales rep” Mark Watts said that as the Journalist was specialist content he would charge non-union members for access online. Yesterday afternoon as my colleague Marc Vallée and I were leaving Climate Camp we found a group of people arguing around the SWP stall that was selling newspapers and leaflets outside the entrance to the camp. As we went in to take photographs the group arguing with the SWP quickly turned their attention to us, shouting loudly that we had not asked their permission before photographing them. They were immediately aggressive and threatening, I managed to calm the ones around me and walk away, however, one young man was persistently threatening towards Marc. They stood a few metres away from the camp, talking for several minutes as Marc explained that he was an independent freelance journalist and that as a matter of principle he would not delete any photographs. The young man insisted that he did not like his photograph being taken and that Marc delete any photographs he had of him. He repeatedly threatened to grab Marc’s camera and delete the pictures himself or smash the camera. After a while we felt that the situation had calmed enough to walk away. Marc said that they should both shake hands and walk away and offered his hand. The man did not take it and as we turned to leave he tried to grab the camera off Marc’s shoulder. I stepped in shouting ‘Oi’ and as I did the man took a step back and kicked me hard in the stomach. We backed away and then walked away from the camp, checking that they were not following us. We realise that these few people and one incident are not representative of the camp as we have covered the movement for some years now. However, we believe that the camp’s policy towards photographers and the media have created an environment that sets the stage for this behaviour to happen. The atmosphere created by your policies and attitude towards photographers worringly parallels the anti-terror laws and attitude that we find the police using against photographers. It is unacceptable to use violence and the threat of violence to intimidate journalists. We do not allow the police to do it and we will not allow protesters to do it either. We would be well within our rights to go to the police and press charges, however, we are not willing to jeopardise our close relationship with so many of those in the protest movement. We ask the man who assaulted us to come forward and apologise and that the camps organisers unequivocally condemn his actions. We would also ask the Camp’s organisers to seriously consider their responsibility for the negative atmosphere they have created within their movement towards journalists. The media are not your enemy, but nor should we be your implicit friends either. We are independent and will report all sides of the story truthfully without fear or favour and that should be what you want of us too. The above is an open letter that has been sent to the Climate Camp media team. A metal fence has been placed around the camp to 'defend' the site. 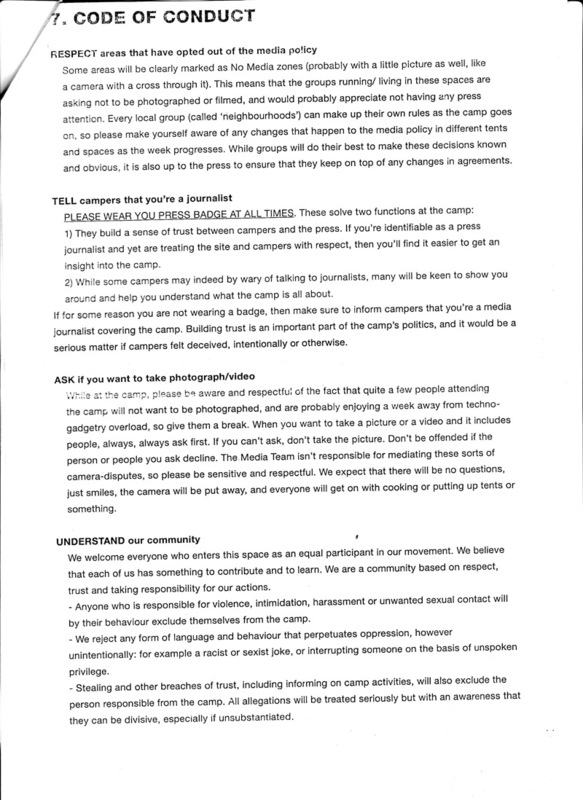 As Climate Camp set up on Blackheath in south London yesterday I got hold of a copy of the code of conduct that journalists will be asked to sign if they want to stay on the camp outside of media hours (10am-6pm) and it makes for fascinating reading. The camp’s organisers claim that all decisions are made with consensus from everyone. But reading through the minutes of the national meetings before the camp, the code of conduct is only ever mentioned in passing. There is never a discussion about what it should be and what it should contain. So what has resulted is the media team’s moral view on what the press should be allowed to do being imposed on everyone at the camp and on journalists. We do not allow the police to impose their moral view of what should be photographed on us, so why should journalists subscribe to the media team’s views? Are they supposing that if the police were to raid the camp we wouldn’t be able to photograph it unless we asked everyone defending the camp their permission first? I spent all day photographing people setting up the camp, I didn’t ask a single one for their permission and no-one asked me not to take their picture. In an interesting twist, this year’s camp is on common land, unlike previous years where they have squatted someone else’s land for a week. So the argument is no longer that they have no right to impose rules on land that doesn’t belong to them, but that they have no right to impose rules on land that belongs to everybody. Their right to be on the land is equal to mine and any other member of the public. Just because they’ve put a fence up does not give them the right to restrict access or impose restrictions on access. Anyone who is responsible for violence, intimidation, harassment or unwanted sexual contact will by their behaviour exclude themselves from the camp. We reject any form of language and behaviour that perpetuates oppression, however unintentionally: for example a racist or sexist joke, or interrupting someone on the basis of unspoken privilege. Stealing and other breaches of trust, including informing on camp activities, will also exclude the person responsible from the camp. All allegations will be treated seriously but with an awareness that they can be divisive, especially if unsubstantiated. Perhaps they copied and pasted this section from something they were going to hand out to campers because I certainly don’t think it can apply to journalists. No interrupting? I’m not sure broadcast and radio journalists will be able to be follow that one for more than a minute interviewing someone. And the idea that journalists would steal, use violence or sexually harass someone on the camp are so far fetched I’m not going to discuss them. I find the last point particularly insulting, I’ll assume they mean ‘informing’ in the sense of passing the police information that was given in confidence, rather than informing people by reporting – as is our job. Not giving unpublished material over to the state is an issue that journalists go to prison for. In any case the campers needn’t worry as we’ve already to agreed to a code of conduct – the NUJ Code of Conduct. And that is the only code I will be agreeing to as I cover Climate Camp this week. Climate Camp: Give it up for the Guardian! Please share your photographs with this groups [sic] as events unfold. We’ll feature some of our favourites on guardian.co.uk and maybe in the newspaper version of the Guardian as well. By posting your pictures in this group you agree to let this happen (though copyright remains with you at all times). Which is a nice way of saying, please send us your pictures so we don’t have to pay photographers for theirs. Now while getting people to send photos and video to news organisations is a old hat for broadcasters, for the Guardian to set up a Flickr group to harvest free content specifically for an event is something new. Citizen reporting is far from the best way to gather news. Climate Camp has always instilled a strong sense of Us vs. Them when it comes to the media and for the Guardian to try and cosy up with the campers and use their content for free has serious implications for how the Guardian reports on the camp. If they want protesters to send them pictures for free they aren’t going to want to be too critical about the camp or actions that people from the camp might be doing. To say nothing of the veracity of the pictures that might be sent in by those opposed to its aims as well as by supporters. It is no longer news gathering when the subject of a story provides their own content – it is propaganda. Would you trust the Guardian if it took content supplied by the police in the same way? Or maybe they should employ professional journalists and photographers to independently report what is actually happening. In a very small way this is actually good for professional photographers as it further invalidates the restrictions Climate Camp organisers want to impose on journalists, which I wrote about yesterday. If anyone can go on to the camp at any time and take photographs – and now thanks to the Guardian’s Flickr group send them straight to the newspaper – there’s no reason that professional photographers shouldn’t be allowed to either. The timing of this event may be by no means coincidental. On the 1st of September (half-way through the camp) photographers will be protesting outside the Guardian because of a new contract they have issued that says that they will no longer pay photographers for reuse of photographs. This means that the Guardian will be allowed to use photographs as many times as they like and syndicate them to other news organisations in perpetuity without having to pay the photographer any more than the original fee for the photographs. Photographers rely on reuse fees to earn a living. Over 800 photographers have signed a petition against the new conditions and many of them, including myself, will no longer supply the Guardian with images after September the 1st until they renegotiate the terms with the NUJ. So if you want professional, uncomprimised reporting and photography from Climate Camp this week you might want to look elsewhere than the Guardian.